Now folks, don’t ask me what Herali Kaayi is? It’s kind of a Green Citrus Fruit, larger than a Lemon/Lime. It kind of looks like an Orange: but its not sweet. It’s very very sour. In Karnataka, India this is called as Herali Kaayi. Not sure if this is grown in other parts of India. This is used to make Chitranna, Juice, Pickles and Gojju. Basically, a drop or two of it can easily substitute a small sized lemon. For comparison, I have the picture of the Kaayi with a small lemon. Could someone enlighten me of its English name? Thanks in advance. I got this Kaayi from my recent India trip. I made Gojju of its juice yesterday. It was really good. I know I am blowing my own trumpet, but yeah, it was really good. The Gojju mixed with Rice becomes HeraliKaayi Gojjanna. I learnt this simple version of the recipe from my Mother-in-Law. My mother makes it in a slightly different way, similar to Kittale Sippe Gojju. Heat a little oil (2 Spoons) and add in Mustard seeds and a couple of curry leaves and red chilies. After the seasoning is done, pour in HeraliKaayi Juice and add Sambhar powder, Jaggery and salt. Get this to a boil. Add in water to get desired consistency. In the end, stir about 2 spoons of the mixture (sesame, dry coconut and besan flour). Let it boil for another 1-2 minutes. Gojju is ready. Taste it once before turning the heat off. Mix gojju with Rice and it makes a delicious Gojjanna. Garnish it with coriander leaves. Gojju can also be eaten in mild with Chapathi's. You could also use the juice as it is to make chitranna. The flavor is different and stronger than lemon juice. Back home they say, Herali Kaayi is good during summer's to beat the heat and also when one is sick and do not feel like eating anything else. 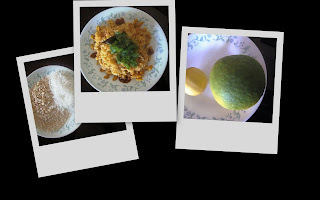 This Gojju recipe will be another entry of mine to Asha's RCI-Karnataka. G!!!! Where the heck did you get Heralikayyi? OMG!! My grandfather's estate has so many trees of Hearalikai,Dodlikai and we used to pluck these for my ajji to cook. :)) Am so glad you girls are excited with this post. Makes me too really happy. I got the kaayi from India. I dont think they grow it here in US. Asha, Hope you are getting my emails with the recipes for the event. ಹೆರಳಿ ಕಾಯಿ is called as sour orange or bitter orange.